Zombie Math Teacher: Zombies invading Wikis near you! Zombies invading Wikis near you! Greetings and Happy Summer Zombie followers! Nearly two weeks after school ended, I finally have a day to sit down and catch up on life. Housework is out of control so I figure a few more days of laundry/dishes piling up won't make much difference. What will make a difference, in the short and long term, is sharing the amazing things my students accomplished in the last few weeks of school. In addition to building a Stage 5 Tetrahedron, we also built our own collaborative Wikis that are now public and editable by members of the Wikispaces community. You may be asking yourself, "What's a wiki?" The simple answer: a wiki is a website developed collaboratively by a several users, where any user can add/delete/modify content. The best wiki sites (like wikispaces.com) are free and have their own web software that is easy to use and requires little to no web development skills on the part of its users. Wikipedia is the most popular example of a wiki. It is a free, online encyclopedia that is amazingly accurate, although anyone on the planet can edit the content. One of the authors of the textbook for my technology course actually tested this theory, by posting 13 pieces of false information on Wikipedia. All were corrected within a few hours!!! So how did all of this come about in my classroom? Well, I had to make a wiki for my grad class anyway and figured it minus well be a purposeful task. I absolutely loathe doing projects for "school" that serve no purpose in my real life. You'd think we'd take that comment more to heart for our own students, since I'm sure they feel it too. We were covering linear equations in my regular math classes, and sequences in my accelerated math class. In my search to find an engaging chapter opener, I stumbled across the Fibonacci video at the top of the page. I was brought almost to tears watching how amazingly mathematical nature is. Not only did I show it to my class, I also linked it to the aloe picture on the home page of the Sequences wiki so students could watch it again if they wanted to. I made two wikis and let the students contribute to them as an assignment choice. I still offered the book and worksheet assignment options as I always do on my math menus, but I went heavy on the technology to stimulate interest and engagement during those last few weeks. Boy did it work out! I've never been able to teach new concepts so late in the year (especially after state testing is over), and have students actually excited to keep learning past grade level standards. 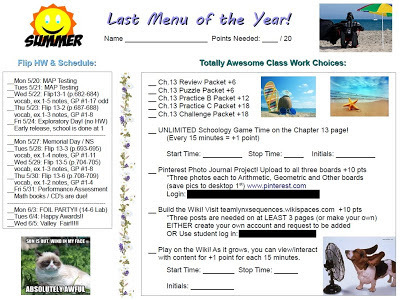 Here is what their last menu of the year looked like. In developing the wiki pages, many of the students were interested in the photo journal choice. I gave them time to use their smart phones at home and school to walk around (with a pass) and take pictures of linear equations and/or sequences. They emailed, texted, Instagrammed, and in some cases, directly posted their pictures either to the wikis or to the Pinterest boards I'd made using universal student logins. This circumvented the issue of students who are not allowed to have their own emails, in that they could sign in as a student, and still use Pinterest and Wikispaces. I would recommend teaching Pinterest posting, Wiki building and Google video/picture searching/saving in small chunks, to small groups of students. And NOT just your G/T group. Some of your lowest, most uninvolved students will be really engaged in technology assignment opportunities. This is one of the biggest benefits to the Flipped Classroom model; my students were able to read the lesson and take notes, and watch example-by-example How-To videos on Holt McDougal's online site. When class time rolled around, we did a quick warm-up of the concepts they had read, talked through the lesson and what was easy/confusing/too hard for them and I had to reteach. Then, we still had 75% of the class time to work on their assignment choices. They branched out all over the place; some doing worksheets with their work groups, others roaming the halls for the photo journal, and still others getting help from me and other tech-savvy students to work on the wiki on our school laptops. We still had a summative quiz, which by then, most students felt was extremely easy. The most valuable learning, however, was looking through the Wikispaces sites and Pinterest boards we had created, and having the students feel they had contributed to something important and meaningful that is out there "published for the world to see". My challenge to you, fellow educators and blog readers, is to click on the wiki picture/links above, peruse what we have made, and see if this is something your students would like to be a part of. 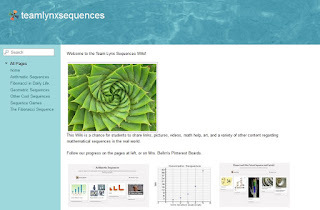 You can either start your own, or join WikiSpaces and ask to be added to our Slope and Sequences wikis. I would be thrilled to see our wikis grow as more classrooms jump on board.